The Zimmermann family comes from a long line of winemaking expertise deeply rooted in German traditions. The family began producing wine in the Nahe region of Germany under the name of Königswingert, which means King’s Vineyard. The Nahe Valley is well known for growing excellent Spätleses and Ausleses from the Riesling grape. The family estate is operated by Linus Zimmermann and his successor, Gregor Zimmermann, who represents the 6th and 7th generations of Zimmermann vintners, respectively, in Germany today. In 1990 the youngest descendant of the Zimmermanns, Josef and his wife Siglinde, moved to Ontario and started a winery with an 11-acre farm below the Niagara Escarpment and called it King’s Court Estate Winery. The winery has grown into a family operation now farming 30 hectares of Riesling, Cabernet Sauvignon, Gewürztraminer, and Pinot Noir grapes. But it is the icewines made from Vidal, Riesling, Gewurztraminer, and Cabernet Franc that the family is most known for. King’s Court Dry Riesling 2006 ($12, kingscourtwinery.ca, winesplash.ca, 87 points) — A chance to buy some nicely aged dry Riesling. The nose shows gorgeous peach and tropical fruits with subtle mineral-petrol notes. It still has some freshness on the palate but is nicely integrated and ready to drink now. Only a few cases remain. 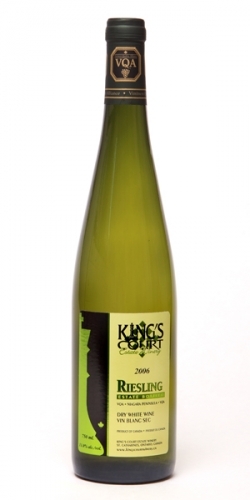 King’s Court Dry Riesling 2010 ($13, kingscourtwinery.ca, winesplash.ca, 86 points) — A nose that displays lime, grapefruit and soft peach fruits. It brings in pear-apple flavours on the palate in a nice round and ripe style. King’s Court Cabernet Franc 2010 ($15, kingscourtwinery.ca, winesplash.ca, 86 points) — A lighter style Cab Franc with aromas of bright red fruits, roasted herbs and leather. The fruit in the mouth is all about black cherries with some cocoa and spice on the finish. King’s Court Iced Pear 2009 ($15 for 375 Ml, kingscourtwinery.ca, winesplash.ca, 86 points) — The nose shows peach, pear and tangerine fruit. It’s quite sweet on the palate with poached pear and marmalade flavours. 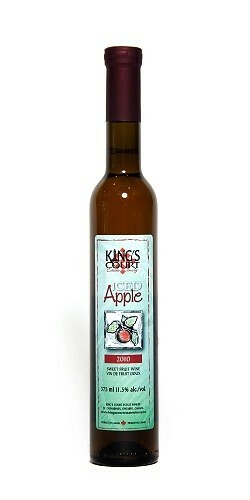 King’s Court Iced Apple 2010 ($15 for 375 Ml, kingscourtwinery.ca, winesplash.ca, 87 points) — Aromas of peach, apple and apricots with tropical fruits chiming in. Love the sweep apple flavours on the palate with finishing notes of peach and apricot. Something quite unique to try. King’s Court Riesling Icewine 2008 ($43 for 375 Ml, kingscourtwinery.ca, winesplash.ca, 88 points) — Pretty nice icewine, with classic apricot, peach and sweet citrus fruits on the nose. It’s sweet and lush on the palate with concentrated and unctuous fruits but a racy vein of acidity keeps it all in balance. King’s Court Ehrenfelser Icewine 2008 ($50 for 375 Ml, kingscourtwinery.ca, winesplash.ca, 89 points) — A deep amber colour with a nose of honey and apples. Quite a unique wine that is lush and soft on the palate with tropical fruits, peach and sweet orange flavours. King’s Court Vidal Icewine 2007 ($30 for 375 Ml, kingscourtwinery.ca, winesplash.ca, 91 points) — A lovely aged icewine that is already showing butterscotch-toffee notes on the nose to go with buckwheat honey and apricot-tropical fruits. It’s developing nicely with ginger spice, super-concentrated fruits and moderate acidity. To enjoy now. King’s Court Cabernet Franc Icewine 2007 ($50 for 375 Ml, kingscourtwinery.ca, winesplash.ca, 89 points) — On the nose this sweety shows rich raspberry-strawberry jam. It’s jammy and soft in the mouth but very tasty. To drink now. Reif Chardonnay Steel 2010 ($11, winery, winesplash.ca, 87 points) — The “Steel” refers to stainless steel, as in no oak was used in this fresh style of Chardonnay from the warm 2010 vintage. The nose shows citrus and apple fruit aromas. It’s ripe yet crisp on the palate with baked apples and citrus fruits. Very clean wine. Reif Chardonnay 2010 ($15, winery, winesplash.ca, 86 points) — Not an overly-oaked Chard, with pear, citrus, apples and soft vanilla notes on the nose. It’s juicy on the palate, tasty and not too complicated. Good everyday white. Reif Estate Gamay Noir 2009 ($17, winery, winesplash.ca, 88 points) — Very nice wine with earthy field raspberry, strawberry and underbrush on the nose. It’s a medium-weight red on the palate with wild red fruits, soft tannins and lightly spiced with black cracked pepper. Angels Gate Sussreserve Riesling 2010 ($14, winery, winesplash.ca, 88 points) — Gorgeous and fruity nose of ripe citrus, lime and touches of white peach. I love the fresh, tart citrus on the palate with tangerine, pear and grapefruit notes. A good example of the sussreserve style. Angels Gate Cabernet Sauvignon 2005 ($20, winesplash.ca, 89 points) — What a treat to be able and buy a well-aged red from Niagara. This Cab has a meaty nose of blackberry, toasted vanilla and spice. It’s beautifully integrated on the palate with dark fruits folding into the spice and tannins. A perfectly mature wine to drink now. Angels Gate Cabernet-Merlot 2010 ($13, winery, winesplash.ca, 87 points) — 2010 is proving to be a great year for Niagara reds. The nose shows bright red fruits, plums, vanilla toast and lovely oak-inspired spices. In the mouth look for ripe cherry, currants and plums with soft tannins and subtle spice notes. A good every day red. Fro those interested in acquiring Niagara Icewines I suggest a quick visit to http://www.niagaraicewineshop.com. MOre icewines than you can shake a stick at and worldwide delivery. 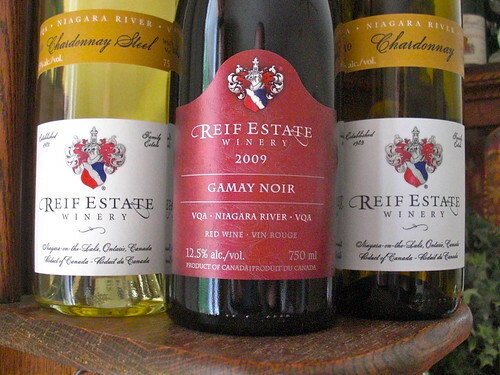 The Niagara wine guy with more than a decade of international wine delivery.